Practice Area: Driving range with grass tees, putting green, small chipping / bunker area. 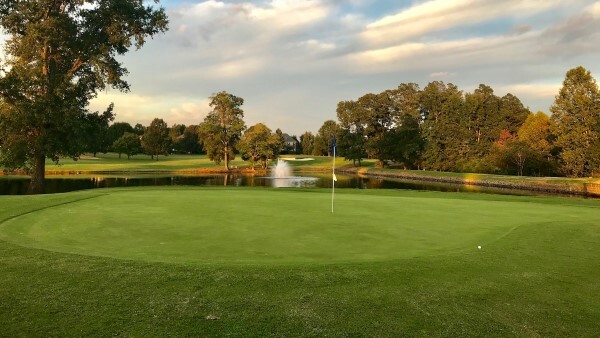 Description: Located off Lawyer's Road in the Matthews / Indian Trail area, this course lives up to the 'lake' in its name, with water coming into play on many holes, including the signature par 5 5th hole -- with 2 shots over the 12-acre lake. It is a semi-private course and is kept in very good shape throughout the year. Notes: Look for coupons in the Charlotte Observer sports section or on their web site. All-inclusive memberships are available and very affordable, compared to other local courses. B-Man's Take: This course has become my home course. It is 5 minutes from my house, I know the staff pretty well and the greens are some of the best in the area. It took some time for me to get comfortable here because the course is definitely challenging. Between the tree-lined tight fairways on some holes, the water hazards / sand bunkers on others, and the slick, sloped, undulating greens, your swing needs to be under control to keep the ball in play and your score down. I've started to have better success here in recent years, as I've learned to stay away from trouble and not hit driver on every par 4. Some holes can still get me, though, including #3, a very long, narrow par 4, and #18, another long par 4 with an approach over a creek, uphill to the toughest green on the course. My favorite holes are the exciting par 5's #5 and #9 with water in play for more than one shot.